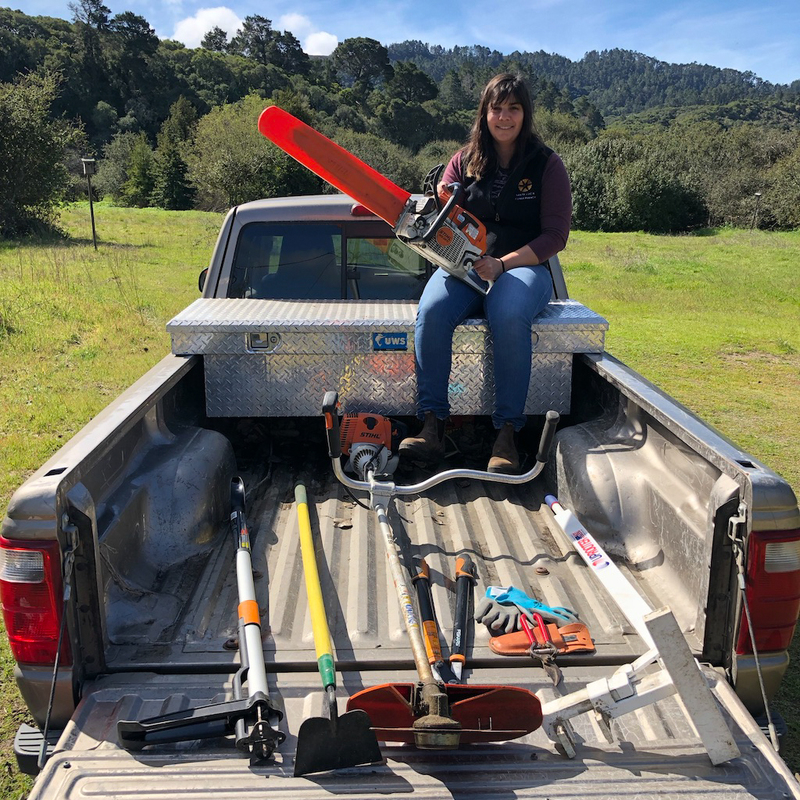 When I first received the exciting news that I would be working with the Conservancy on the Santa Lucia Preserve, I did not really know what was in store for me. However, spending the day at Peñon Peak filled me with enthusiasm about my role here as the Natural Lands Manager. Surrounded by the call of raptors and buzz of bees busily pollinating nearby flowers, I felt myself quickly connecting to this special place. Bending to observe the wildflowers more closely, I realized in horror, that the bee nearest me was sitting atop a familiar, vibrant yellow bloom and was vigorously collecting its pollen. My hands, covered in protective leather gloves, clasped my tool belt, patting clockwise around the belt until I grasped the right tool for the job. My pulse rate regulated, knowing for each invasive weed there exists a perfect tool that every weed warrior should have in their toolkit and I had just the tool for the job. When it comes to sinister French broom or tough, deep-rooted weeds like yellow star thistle, only a weed wrench will do. If you grease the hinge before each season, it will make light work of pulling weeds and is great at removing roots with just a push on the handle. The tool that I use most frequently is my old reliable hori hori, a dirt knife. It is great for digging up roots for a variety of plants and the serrated edge makes cutting roots or flowers a simple task. It also doubles as a planting tool. The hori hori is an essential tool for every kit, but for larger weeds and bigger weed patches, it won’t cut it. When encountering thistles, a standup weeder is efficient and satisfying. The prongs grab at the roots while leveraging the rosette out. Then with a push on the handle the plant ejects. If you don’t have one, a hoe or hand mattock will also do the trick. Often, you’ll stumble upon weeds that are flowering or seeding. In these situations, pruners or loppers are the best intervention. Simply clipping off the flowers or seed heads will help stop the spread of weeds. Afterwards, make sure you bag the flowers and seeds for removal. If you’re wanting to cover large areas in a short amount of time, there is a power tool worth considering. String trimmers can be used on thistle and grasses when there are no flowers or seeds on the plant. When you are done, brushing the string trimmers off in the area they were used will help prevent weeds spreading. After tying up a large contractor bag filled with yellow star thistle, I remove my gloves and the long sleeve layer I’d worn to protect me from poison oak oils and sit under the shade of a coastal oak. Looking down on the hillside I just cleared of invasive plants and out across The Preserve, a wave of satisfaction rolls over me. The task of managing invasive weeds across this land is undoubtedly a daunting one but the gratification I get connecting to the land and community is unparalleled.